Oak End Panels are constructed using 1" thick Solid Oak for started and adder panels. Maple End Panels utilize a 1" multi ply veneer core for started and adder panels. Shelves are available in 3/4" solid Oak or Maple. All units come standard with back panels. All shelving units feature solid hardwood dovetail jointed frames. 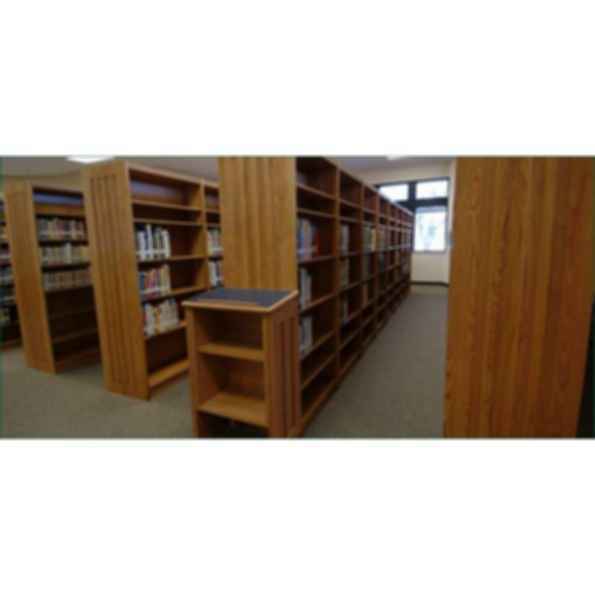 Shelving has the option of having continuous tops or "captured" canopy tops. Canopy tops feature the beveled edge fascia. Standard Height: 36",42", 48", 60", 72", and 84". Tesco Learning Environments is committed to making our furniture last a lifetime. While many companies have switched to lower-priced, lower-quality materials, Tesco has not wavered from our commitment to quality. We use more solid hardwoods than any other educational manufacturer. Despite the trend toward international outsourcing, Tesco continues our commitment to employing hand-selected hardwood from the northern regions of the United States and from supplies that assure responsible forestry management policies.